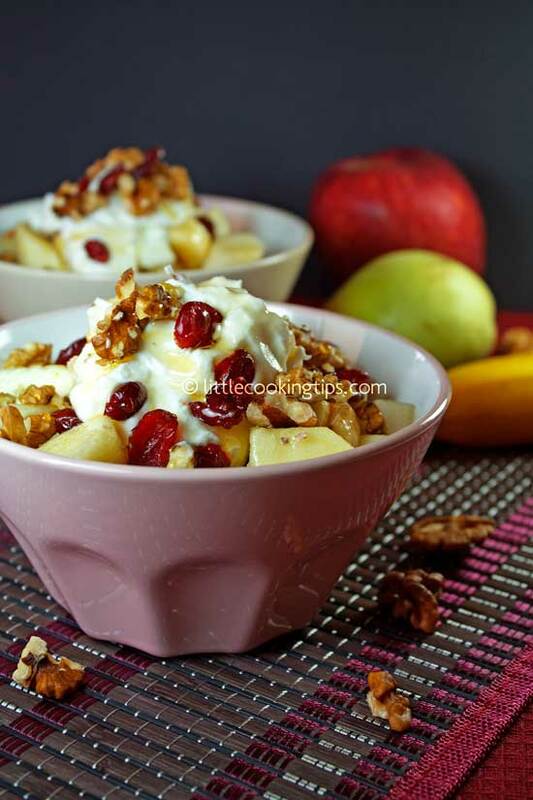 ﻿ Apple, banana and pear salad with Greek yogurt and dried cranberries: a fruit salad recipe you will make over and over! This fruit salad recipe is one of the best, tasty, healthy recipes we ever made. It’s an easy healthy food recipe that is ideal for breakfast, dessert, or as a snack served any time of the day. Its main ingredients are banana, apple and pear, combined with honey. We added walnuts for crunchiness, Greek yogurt for a fresh creamy topping, and dried cranberries for their sweet fruity taste. The result was sooo delicious, that made us add this nutritious delight in our menu for at least 2 times a week! Besides being a healthy snack idea, this recipe is very very simple, and quick to make. It has beautiful colors, making it a pretty dish to serve as a dessert if you have people over. If you were wondering how to make a fruit salad that is great both for adults and children, this is a healthy choice you cannot afford overlooking. Each bowl is a superb healthy boost, full of vitamins, antioxidants and fiber. If you are not a big fruit lover, this specific recipe will make you rethink fruits as a part of your diet. If you can’t find or don’t like the cranberries, you can also make this salad with raisins with a different, also interesting result. You can also try any fruit combination you prefer, like orange for example instead of pear. Feel free to adapt the recipe, adding your favorite fruit combinations. But make sure you add the honey and the yogurt with the walnuts when you serve. If you can't find dried cranberries, you can also use raisins. Put the fruits in a bowl. Add the honey, stir and let it marinate for 10 minutes. Place an equal amount of the fruits in 2-4 smaller bowls and add the yogurt (about 1-2 tablespoons per bowl). Garnish with the walnuts and the cranberries and drizzle with a little more honey. Kali oreksi! 1. You can adapt this recipe using any fruits you like. 2. You can also add some orange juice along with the honey in the marinade and some vanilla extract in the yogurt. 3. If you are allergic to walnuts or dried fruits, you can omit them. 4.If you can't find cranberries, you can also use raisins, the result is equally great.